The perfect place to watch SpaceX launch rockets from its Boca Chica Beach facility might just be 110-feet high off the ground on top of Disposal Cell 3 at the City of Brownsville Landfill. On a windy Monday morning, the sun could be seen glinting off of the stainless-steel prototype “Starship” that’s caught the attention of SpaceX followers across the country. Viewers could see as far away as the Bayview wind farm, the Sapphire Condominiums on South Padre Island, the University of Texas Rio Grande Valley water tower in Brownsville and off into Mexico. The view dwarfs the border wall, which can be seen from Disposal Cell 3 where it ends near the landfill as Highway 4 approaches the soft Border Patrol check point. And for Rio Grande Valley residents looking for options to watch future launches, city of Brownsville District 2 Commissioner Jessica Tetreau Kalifa said the Texas Commission on Environmental Quality has given city officials the green light to place non-permanent structures, like bleachers, on Disposal Cell 3, which is no longer in use, for launches. “It’s weird that it’s the landfill, but it fits so perfectly,” Tetreau Kalifa said, referencing all of the important sites and landmarks that can be seen from the spot. But the city’s plans stretch beyond just staging launch watches at the landfill. Tetreau Kalifa said city staff want to build an observatory somewhere on the City of Brownsville Landfill where the city’s stargazers, young and old, can come to view the majesty of space — just miles from SpaceX. City Commissioners are scheduled to discuss the plans during a Tuesday workshop. Tetreau Kalifa said she came up with the idea of an observatory after visiting the Griffith Observatory in Los Angeles while she was there to tour SpaceX facilities and to attend the SpaceX-sponsored Hyperloop Pod Competition, which is where student and non-student teams participate in a competition to demonstrate how the Hyperloop concept would work. When she returned to Brownsville from that trip, she said she began scouting locations in the city where it would be possible to build an observatory and to see SpaceX rocket launches. “We wanted a place that was safe where families would come,” Tetreau Kalifa said. And while some might not know it, the City of Brownsville Landfill is already a destination for tourists. Birders flock from all over the state, country and world to the landfill, which attracts a multitude of species. Just last weekend, a group of approximately 50 birders was at the landfill. 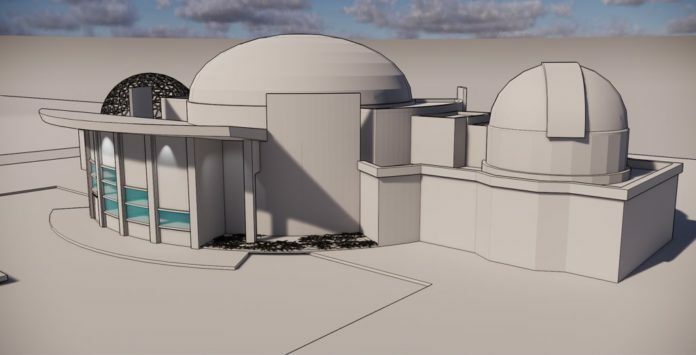 Tetreau Kalifa provided the newspaper with conceptual drawings, which show officials are thinking about including an amphitheater with the observatory, where some of the dirt might be red — an homage to Mars, where SpaceX founder and CEO Elon Musk has previously said that one day the first person to go might do so via Boca Chica Beach. If the project goes forward, that would provide the residents of Brownsville and Cameron County a second location to watch SpaceX launches. Cameron County is nearing completion of an amphitheater at Isla Blanca Park, which officials have said would be an ideal spot to watch launches. As for the City of Brownsville Landfill watch site, Tetreau Kalifa said it is outside of the evacuation zone that will be set up for launches and would provide Brownsville residents an alternative to Isla Blanca Park. The proposal for the Observatory and launch watch site includes a separate entrance to the landfill from Boca Chica Boulevard and Oklahoma Avenue. Tetreau Kalifa said city officials should be able to provide more information about the project, including possible funding sources, after Tuesday’s work session. Musk has hinted that test launches here could begin as soon as April or March.